Chapter 5! GET READY FOR A GREAT YEAR! Step 1: Go back to the beginning of the chapter and complete all of the “Day One” tasks outlined there: notify your accountant, set up your accounts (if you haven’t done so already), and make your first Profit Account deposit or transfer. Look at your bank balance in your operations account; subtract any outstanding checks and payments you have from that account, divide the remainder into your accounts based on your TAPS. Step 2: Start a “celebration list”: come up with ideas for how you to spend your quarterly owner’s distribution. Include small treats and big indulgences. Post the list where you can see it, for inspiration and motivation and as a reminder when the quarter comes around and you convince yourself there are more practical uses for the money. Step 3: Based on the system Mike shared in this chapter, revamp your to-do list and start using it immediately. You can download blank Profit First To-Do forms, from the Resources tab at MikeMichalowicz.com. Cancel whatever you don’t need to help your business run efficiently and keep your customers happy. Negotiate every remaining expense, except payroll. While you are cutting your expenses, implement the Task Management List to increase your revenue over the next 60 days by serving your existing clients more efficiently. I love that Mike has all the Profit First worksheets on his website, you can download them by clicking here. You can also get access to Mike’s Wall Street Journal articles, book excerpts, and entrepreneurial tips by subscribing to his website. 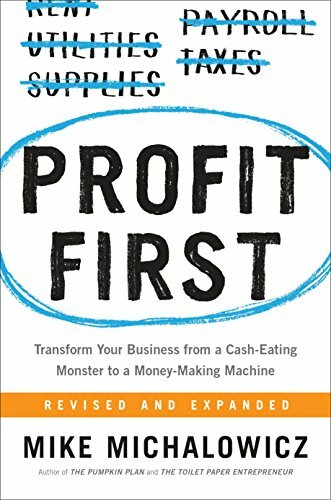 He has the first couple of chapters of Profit First for free!